Sisters of Saint Benedict's Monastery: Hallelujah! “We are born with God pulsing through our veins!” S. Joan Chittister writes (Monastic Way, 1/2015). What a splendid image and feel for the life that surrounds us these Easter days and which somehow is pulsing within us, too. 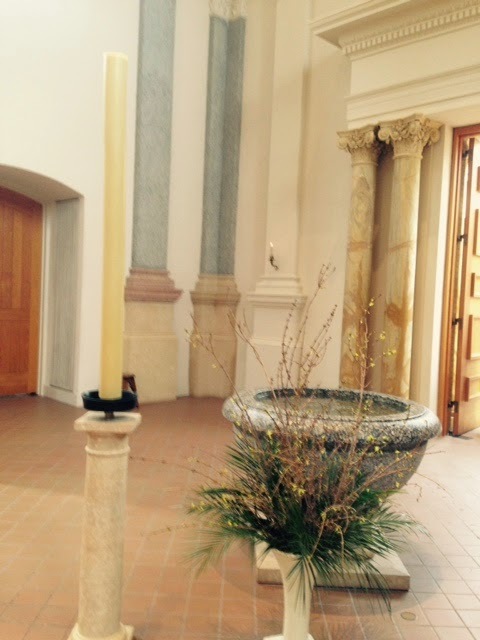 Having followed the cross as best we could for the 40 days of Lent makes us run to that emptied Cross now, luminous in white and yellow banners, Easter lilies and hydrangea. We want to go on those Easter egg hunts, along with our children—or at least color the eggs that will attract our attention so that we might search the more for what they mean: life and love and joy, taste and sound and nourishment. We want to gather it all in, and be gathered in-- the young and the old, the lame and the runners, the white and the colored, the heavy-laden and those of teeming spirit, the saints and the sinners! We want to gather, even though we may not do so any of the other Sabbath days of the year. There’s something about Easter! May it go on and on and on! God is again pulsing through our veins, in the meadows’ flowing rivulets, in the sap rising in the maples, in the sun hanging above us later and later each day. All seems to call us to stand on high, to notice, to join the dance of our oft-sung Alleluia choruses: HE LIVES, YOU LIVE, WE LIVE, HALLELUJAH!